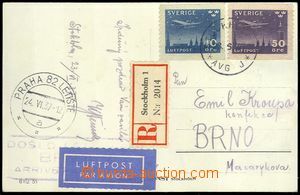 1937 Reg and airmail postcard to Czechoslovakia, franked with. air stamp. 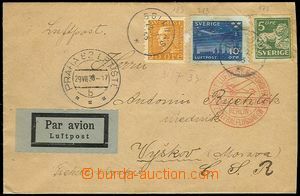 Mi.213-214, CDS STOCKHOLM/ 23.6.37, transit pmk PRAGUE 82-Airport/ 24.VI.37 and arrival framed pmk Came By Air / Brno 2; decorative!